Intel just launched the first in a series of new processors based on its Skylake architecture. Is it a winner? On Aug. 5, Intel (NASDAQ:INTC) released its next-generation PC enthusiast-oriented desktop processors based on its new Skylake micro-architecture. Skylake represents a new micro-architecture built on the company's 14-nanometer manufacturing technology on which it began producing its prior-generation Broadwell chips on last year. With Skylake now launched and with third-party reviews of the chips abound, let's see if this new processor architecture from Intel delivers. The highest-end Skylake part that's being launched on Aug. 5 is the i7 6700K, featuring four multithreaded CPU cores (eight logical processors) running at 4GHz base/4.2 GHz turbo as well as a GT2 configuration of the company's ninth-generation graphics and media engine. In terms of CPU performance, tests carried out by PC Perspective show an improvement over the prior-generation Haswell processor family of between 10% and 15% depending on the test. Given that Haswell already delivers extremely good per-clock performance, and given that Skylake delivers these improvements without sacrificing much in the way of frequency (the Haswell 4790K can turbo to 4.4GHz out of the box, while Skylake goes to only 4.2GHz), this appears to be a pretty solid improvement. Although the integrated graphics engine on these new Skylake parts is unlikely to be of much interest to the enthusiast PC market, Intel still brought some very interesting improvements on the graphics front. In terms of 3D gaming performance, the Skylake-based 6700K shows a meaningful improvement over the prior-generation Haswell-based i7 4790K. PC Perspective showed that in the popular game BioShock Infinite, at 1920-by-1080 resolution with graphics settings at "low," Skylake delivers 48.2% higher average frame rates. In the game GRID 2, at 1920-by-1080 resolution and "high" settings, PC Perspective's tests show that the integrated graphics engine on Skylake is able to deliver 28% higher average frames per second than the Haswell solution. And, finally, in the game Metro Last Light, at 1920-by-1080 with "low" settings, Skylake's integrated graphics engine rockets past Haswell's, with an over 50% performance improvement. 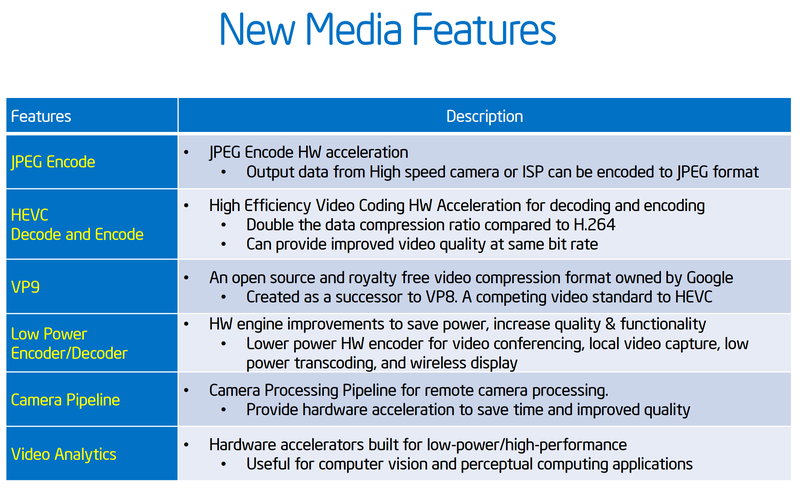 To make the deal even sweeter, Intel has integrated a bunch of video encoding and decoding hardware in the chip to take the load off the CPU when playing back various types of video. As AnandTech's Ian Cutress points out, these specialized hardware accelerators probably won't make too much of a difference for relatively power-unconstrained desktop workloads, but in battery-constrained mobile form factors, moving these media features from the CPU to dedicated hardware may lead to significant power efficiency improvements. For the desktop enthusiast market, Skylake is hardly a game changer. It is a solid evolution over the Haswell architecture, and as many review sites have pointed out, the accompanying platform to the processor brings some very cool new features for enthusiasts. I tend to agree with the prevailing sentiment that PC enthusiasts still rocking systems based on the 2011 Sandy Bridge architecture (or older) would probably see a tangible benefit in moving to Skylake. Even though Skylake looks like a solid performer in enthusiast desktops, I expect that chips based on the architecture will really flex their muscles in notebooks and 2-in-1 convertibles. Not only will those form factors benefit most from the company's new 14-nanometer manufacturing technology, but a lot of the architectural improvements that Intel has made in these Skylake chips -- particularly on the graphics and media side of things -- should be much more appreciated in power- and battery-constrained form factors. All told, Intel has done a good job of making its silicon faster, more efficient, and more capable each and every year, and these improvements still don't appear to have catalyzed a major uptick in PC demand. That means, despite what looks to be a solid technical achievement, I don't think Skylake will do much in and of itself to give the broader PC industry the jolt it so desperately needs.